Emory Orthopaedics & Spine Center will provide advanced technology using 3D printers to design custom knees for patients in Johns Creek. The technology, made by ConforMIS will offer quicker recovery, less blood loss, easier range of motion and better long-term wear for patients. 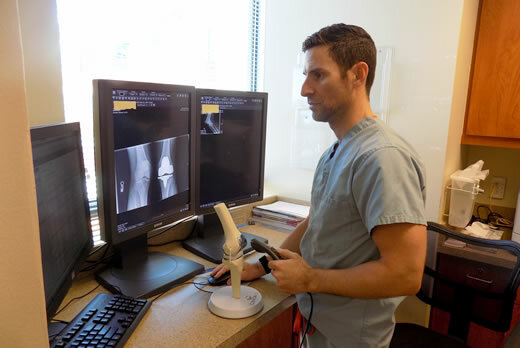 "After performing a CT scan, we use an automated design that maps the size and shape of the joint in 3D," says Mathew Pombo, MD, orthopaedic sports medicine surgeon and assistant professor of orthopaedic surgery at Emory School of Medicine. "The software allows us to precisely match implants and instrumentation to the model of the knee." The design of the knee implant is then printed off using a 3D printer. Pombo says this procedure is the only knee replacement implant that’s truly patient specific and designed for each individual. Pombo’s practice is based on caring for the elite athlete during their careers and afterwards. "The unfortunate reality is that all athletes transition from their prime into the aging athlete category where you can see the impact from a lifetime of sports and activity," says Pombo. "The patient-specific 3D knee implant is ideal for an aging athlete who suffers from an arthritic knee and is considering surgery." Patients’ hospital stays have also been reduced by this procedure, which allows surgery to be performed as an outpatient procedure with patients returning home on the same day. Pombo has performed approximately 500 customized 3D knee replacements. For more information about Emory Orthopaedics & Spine clinics, please call 404-778-3350.